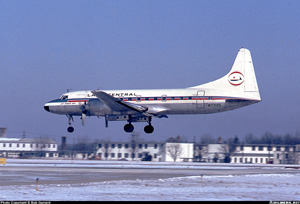 On March 5, 1967, a Convair 340, operated as Lake Central Airlines, Inc. Flight 527, crashed near Marseilles, Ohio. All 38 persons aboard were killed and the airplane was destroyed. The accident investigation discovered that all four blades of the right propeller separated in flight. One of the four blades penetrated the airplane fuselage in such a way that the structural integrity was significantly compromised. The massive structural damage and the loads caused by a violent yaw to the right resulted in the fuselage failing along the line of penetration and breaking apart in flight. Further investigation of the right propeller showed that the helical splines of the steel torque piston for the blade pitch change unit were worn away and the torque cylinder was completely failed due to fatigue. A secondary failure of the steel torque cylinder occurred and prevented propeller oil pressure from being maintained and holding the propeller pitch. As a result, the blade pitch moved from coarse to fine pitch so rapidly that the propeller pitch lock mechanism became ineffective and failed to arrest the propeller overspeed. Operation at low pitch, or high revolutions, during cruise flight then caused a centrifugal force so great that the blades exceeded their design limits and separated from the propeller hub. It was later deduced that the cause of the torque piston spline wear occurred as a result of omitting a critical material hardening process during manufacturing called nitriding. The failure of the right engine propeller to maintain proper blade pitch was the probable cause of the accident as concluded by the safety board. The root cause was due to a critical surface hardening process (nitriding) being omitted during manufacturing which caused a key propeller safety feature to fail during flight. The safety board discovered that the omission of the nitriding was associated with a special manufacturing process that disrupted the normal production flow.